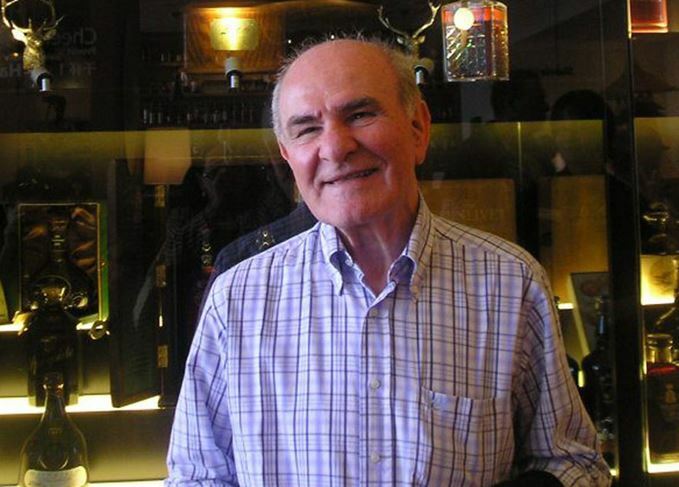 Valentino Zagatti has dedicated almost three quarters of his life to collecting whisky, resulting in one of the most famous collections in the world. An exhibition of his collection opened in the Netherlands this week. Zagatti flew in from Italy, and met with Thijs Klaverstijn to talk about his extraordinary life journey. The Scotch Whisky International (SWI) building is quite an unassuming one, located on an unassuming street, part of an unassuming business park in Sassenheim, a town not far from Amsterdam in the Netherlands. It is sandwiched in between a retailer of building materials and a boat dealer – a far cry from the glens, stags, and lochs often associated with Scotland’s usquebaugh. If it weren’t for the signage on the building’s exterior, you’d never expect to find any Scotch whisky in this part of the world. Yet it is here that one of the most remarkable whisky events of the last five years takes place. Several dozen people inside the SWI building are sipping their drinks while conversing about their latest whisky conquests. Names of different distilleries float around the room, escaping the murmur of voices. Macallan, Glenfiddich, Glenfarclas, Highland Park. Among the crowd of bigwigs are representatives of companies like Gordon & MacPhail and Edrington, as well as investors. Investors? Yes, investors. SWI is an investment firm, as the stock ticker fitted alongside their building betrays. A few members of the press are also present. All these people are here because an Italian decided to stop smoking almost six decades ago. Valentino Zagatti, 84 years old, is the man of honour today. From 1960 onwards he made it his life goal to amass one of the most diverse whisky collections in the world, surpassing some 3,000 bottles, and containing many of the rarest whiskies. It literally filled the family home in Lugo di Ravenna from floor to ceiling – only the master bedroom and bathroom were spared. Four years ago it was sold to SWI, backed by a group of 20 investors. The opening of that museum is the reason why Zagatti made the trip to the Netherlands, bringing along his children and grandchildren. Patiently awaiting the official opening ceremony, the Zagattis are sitting comfortably in big leather armchairs on the second floor of the SWI building. After a short speech by CEO Michel Kappen, Valentino Zagatti is invited to open the doors to his life’s work. As he enters the room, Kappen and his family have to explain to him what is going on, because Zagatti has been blind for all of his adult life, and part of his childhood too. Upon hearing the room described to him, Zagatti is incredulous. Rows and rows of display cabinets line the walls, sublimely highlighting each bottle in the collection. At the centre of it all is the pièce de résistance, a bottle of Scotch whisky from 1843. Kappen and Zagatti spend a private moment in front of the custom-built glass case containing the bottle, which was gifted by a father to his daughter for her wedding. This much is clear: even though Zagatti might not officially own it anymore, the collection still is very much his. If there was ever someone whose life was turned around by whisky, it surely is Valentino Zagatti. Collecting whisky is what he does. It gives him purpose. Or as he puts it: ‘The collection is what gives me joy in life.’ Before he started collecting he was an accomplished accordionist, teaching at Rome’s Lanaro academy, and winning the Italian championship in 1956 for classical accordion music. It brought him great happiness and pride, yet something was missing. For Zagatti, the thrill of collecting is finding a bottle previously thought to be un-findable. He remembers a particular bottle of Bowmore eight-year-old, which he eventually bought from Giovannino Guareschi, the famous Italian writer of Don Camillo, a series of books that was later turned into films. Zagatti still gets giddy when mentioning what he paid for it: 30,000 Italian lira – or just over £13. His biggest victory though, came at the expense of another famous Italian collector.